After breakfast, get ready to explore one of the most enticing islands in the country of Thailand. Get transferred by ferry to James Bond Island, where 'The Man With the Golden Gun' starring Roger Moore and Christopher Lee was filmed in 1974, and silently kayak through secret lagoons and small passageways that open to majestic caves. 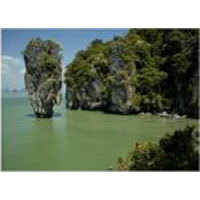 This exciting trip offers views of the best of Phang Nga Bay's amazing landscapes. Enjoy delicious dinner at a local Indian restaurant in the evening followed by overnight stay at the hotel. Meals: Breakfast & Dinners included. After an appetizing breakfast, embark on a Phuket Island Tour to explore the beauties of Phuket. Phuket's gorgeous beaches, throbbing nightlife and the ancient structures will leave no stone unturned to enchant you with its beauty. Phuket is famed for its beautiful beaches and your scenic drive takes in some of the island's gently sweeping bays of golden sand. Later, get ready to enjoy Phuket Fanta-Sea show in the evening. The Phuket Fanta-Sea has been billed as the ultimate cultural theme night park. Have dinner at Phuket Fanta-Sea. Enjoy a comfortable overnight stay at the hotel. After breakfast, check out from Phuket hotel. Board your flight to Pattaya, and after arrival in Pattaya check in to your hotel. Spend the rest of the day at leisure. In the evening, sit back and just enjoy the magnificent Alcazar show. The Alcazar show has been entertaining the world for over 20 years. The enigma about the Alcazar show is that all the singing and dancing performances are done by transvestites- and it is pretty hard to figure out that the beautiful ladies dancing in front of you are male from origin. After a thoroughly delightful Alcazar show, enjoy a sumptuous dinner at a local Indian restaurant. Later, enjoy a comfortable overnight stay at the hotel. After breakfast, enjoy coral island tour by speedboat. 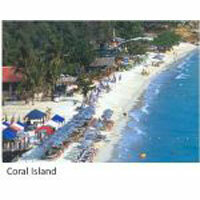 The Coral Island tour is one of the most anticipated activities for any tourist in Pattaya. While you whistle past the Coral reefs in your speedboat, you can fill your senses with the ethereal beauty that surrounds the coral island. After the thrilling speedboat tour of Coral Island, enjoy an awesome lunch. In the evening, have dinner at a local Indian restaurant and have a comfortable overnight stay at the hotel. Meals: Breakfast, Lunch & Dinners included. Enjoy city tour of Bangkok, a buzzing dynamic and exotic city with a curious blend of the East and the West. Passport valid for at least 6 months from the date of expiry of the desired visa. Two recent (not older than 6 months) passport-size color photographs taken against a white or light blue background (35 x 45 mm)The photographs should be clear and of good quality, and should be printed on normal photographic paper It should be pasted on the visa form and not stapled Applications submitted with scanned photographs will be refused by The Royal Thai Embassy and the visa fees will not be refunded. Funds 20,000 Baht per Applicant or 40,000 Baht per family is essential. Deposit of 50% of the Holiday Cost if the travel date is more than 20 days from the date of booking. Deposit of 75% of the holiday cost if the travel date is more than 10 days from the date of booking. Deposit of the holiday cost (100%) if the travel date is less than 10 days from the date of booking Photocopies of the passport. Full payment is required on confirmation of all services and before departure.Airline seats & Hotel rooms are subject to availability at the time of booking Rates are subject to change in case of any changes in airport taxes, hotel rates, rate of exchange, transport rates, government taxes or entrance fees Any meals and services unless specified in the itinerary are not included The rate of exchange taken for computing the above price is Rs. 52 to a USD. In the event of an increase in the ROE, the prices defined may change. Airline seats & Hotel rooms are subject to availability at the time of booking Rates are subject to change in case of any changes in airport taxes, hotel rates, rate of exchange, transport rates, government taxes or entrance fees Any meals and services unless specified in the itinerary are not included The rate of exchange taken for computing the above price is Rs. 52 to a USD. In the event of an increase in the ROE, the prices defined may change.